So I've hit a milestone. Exactly one year ago my maternity leave ended. And let me tell you...maternity leave is no vacation. Oh no. No no no. You get this picture. That girl was always eating. Maternity leave was a never ending cycle of putting her to sleep, giving her a formula bottle, pumping, and nursing her. Looking back on those days it's amazing we make it through that. Newborns are hard work. Newborns require every single ounce of your energy. Newborns make time move at warp speed. It was just a year ago, but looking at photos of her from a year ago it feels a totally different decade. But...we made it. My Lilly is a now almost 14 months old, running all over the place, saying "cat", and most importantly....sleeping through the night. She still doesn't sleep beyond 6:30am, but I'll take it. If this past year has taught me anything, it's that time moves way too fast when you have a child, so for right now I'm trying my hardest to live in these moments and when 6:30am rolls around be thankful that I have a sweet, happy, healthy toddler to wake me up. This weekend for breakfast we made a typical Dominican breakfast dish called Mangu (post coming soon). Mangu is mashed plantains and this dish is topped with pickled red onions. 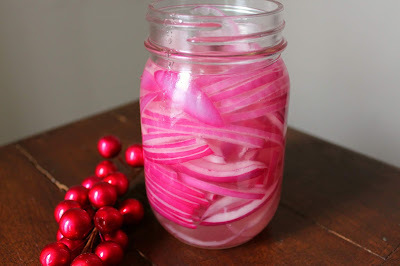 These sweet pickled red onions are so addicting I got up several times during breakfast to reload my Mangu with red onions. These are so crisp and the tart bite of the vinegar is nicely balanced with the sugar making it the ideal savory sweet garnish. Add these to burgers, tacos, eggs, and of course..Mangu. 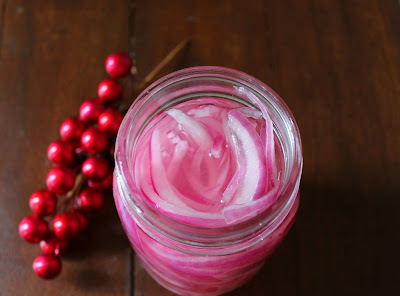 Any dish you'd typically add fresh red onions just swap out for these sweet pickled red onions and I promise you you'll never go back. 1. Slice the red onion thin. Some people prefer to keep them in rings, but I prefer mine to chop mine into slivers. 2. Mix together the water, vinegar, salt, and sugar. Place chopped red onions in a mason jar. If you don't have a mason jar a bowl or other container will work. Pour the vinegar mixture over top making sure to cover all of the onions. Let sit at least 1 hour before using. Then, store in the fridge for several weeks.